A cheat sheet for intaking service requests and dispatching tasks to staff. 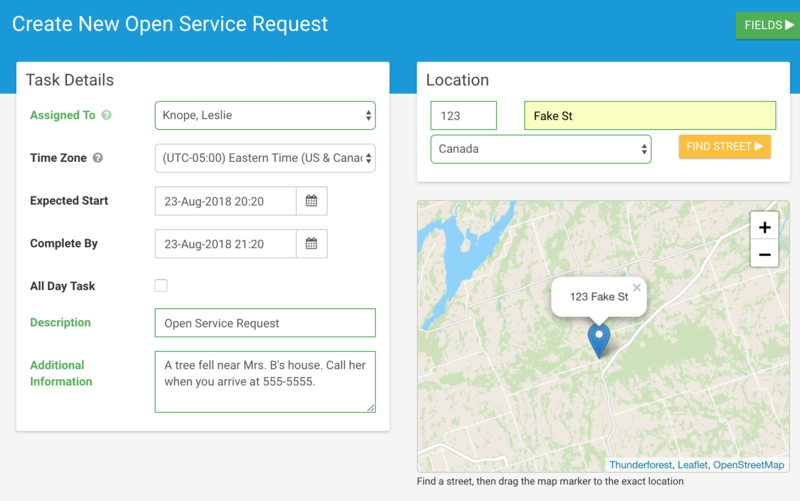 The service request task template is designed to streamline taking service requests and dispatching them to staff. 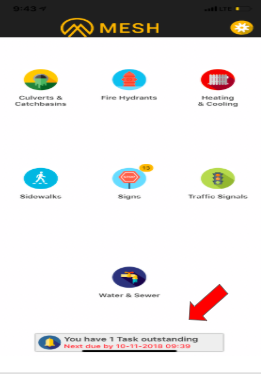 In it's basic form it can be used to cover most common civilian calls including; garbage, water, potholes, street lights, sewage, etc. 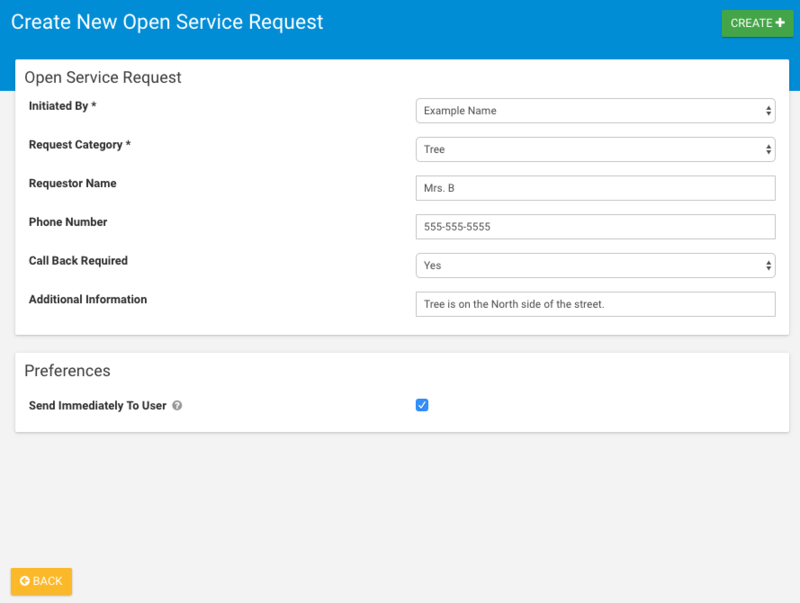 When a call comes in, you simply create a new task from the service request task template and staff will be notified immediately. It’s that simple! 1. Using the navigation menu on the left side of the web platform, click on the Task & Dispatch and select Task Calendar from the drop down. You will see all of your current tasks. 2. Create a new task from template by clicking on the 'ADD NEW+' button in the upper right corner of the task calendar page. This will prompt you to choose how you would like to create your task. 3. Click on the drop-down menu for ‘Create a Task from a Template’, and select ‘Service Request’, then click 'CREATE'. 4. Enter the task details and locations. You can choose who you want to assign the task to, the expected start date, when it needs to be completed by, the location, a brief description, and any additional information. The expected start date will default to 3 days from when it was created. You can change this, or make it an all day task if no specific time frame is needed. When you are finished inputting these details, click the 'FIELDS' button in the upper right corner to proceed to the next step. 5. Add task present fields. All fields in the service request form can be filled out ahead of time by the task dispatcher. We recommend filling out who received the service call (Initiated By), the type of work that is being requested (Request Category) and the name of the civilian who called in the request (Requestor Name). Fields with asterisks are required, but this can be changed in the task template. The names of staff intaking service requests can be added to the drop down list for 'Initiated By' by opening the datasource for 'Service Request - Initiated By', or contacting Go Evo for help. When you are finished, click 'CREATE+' to send your task. The task will now appear in the task calendar. Whoever you assigned the task to will receive a notification on their mobile device. App users will click on the notification at the bottom of their screen, and then click on the task to launch the details. The form is already pre-populated with initiated by, request category and requestor name. Users will be prompted to fill out the resolution, whether the callback was complete, if callback was required, and take a photo. Once completed they will click 'Upload' to get back to the details screen, and click 'Done' in the upper left corner to complete the task. Once this is complete, the task will turn green in your task calendar, indicating the task is complete. If the task dispatcher wants to review the task, simply go to the Data Entries section on the navigation menu. Using the drop down, select Feed View. Here you will be able to view and access the completed record. This area is like a social media feed for your digital filing cabinet.